As a CSR initiative by Richard Peiris and Company PLC (ARPICO), recently donated a total water solution to Welewewa Sumedha Vidyalaya in Anamaduwa which coincided with the observances of the UN International Day for Eradication of Poverty organized by the United Nations Information Centre (UNIC) Colombo. Under this programme, Arpico Partnered with the UNIC to assist the school in setting up a model farm for the benefit of the school children and to enhance their knowledge on Agriculture with the use of modern technology. The total water solution for the purpose was provided by Arpico using Arpico water tank, Arpitech water pumps and Arpico PVC pipes and fittings. 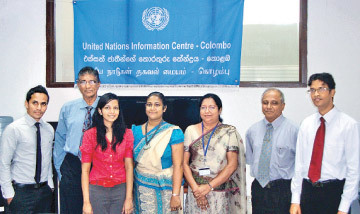 International poverty eradication day program organized by the United Nations Information Centre - Colombo (UNIC), which had the theme “modern use of technology in agriculture”. By this program the United Nations Information Centre – Colombo has set up a model farm at the school premises for the benefit of the school children to enhance their knowledge on Agriculture with use of modern technology and the total water solution was provided by Arpico using Arpico water tank, Arpitec water pump and Arpico pvc pipes and fittings . Over 20 years ago, Arpico introduced the first plastic water tank and is ISO 9001:2008 certified for its unique manufacturing process. Arpico Triple Layer tanks, Arpico Sump Tanks, Aqua Tough Tanks, Arpico Septic tanks, Arpico Garbage bins, Green Gas Unit and Arpico Compost bins are some of the novel products manufactured by the company and is the leader in providing a complete water solution with Arpico PVC pipes and fittings, Rubber and PVC Hoses. The Arpitec water pumps are available in 32 models which the premium models are built using lead free non-corrosive metals, which will not add any substance to the water during the process and deliver water for domestic, industrial and agricultural sectors. Arpitec Door Step service is another innovation by Arpico to service the customer within the shortest period of time to ensure uninterrupted water supply. Richard Pieris and Company PLC embraces a rich heritage of over 80 years, is one of the largest and most successful diversified business conglomerates in Sri Lanka. Being one of the oldest is also one of the largest employment providers with an employee base of over 30,000 in the private sector.